Bluffer's Beach is perhaps the most beautiful beach in Toronto. 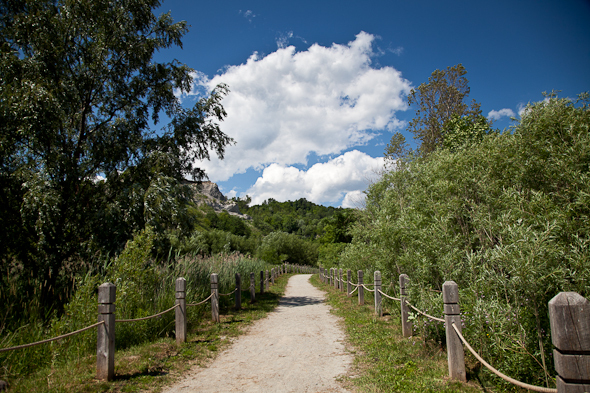 Nestled at the foot of the Scarborough Bluffs in the city's east end, Bluffer's is a rare man-made park that still succeeds in feeling wild and timeless. 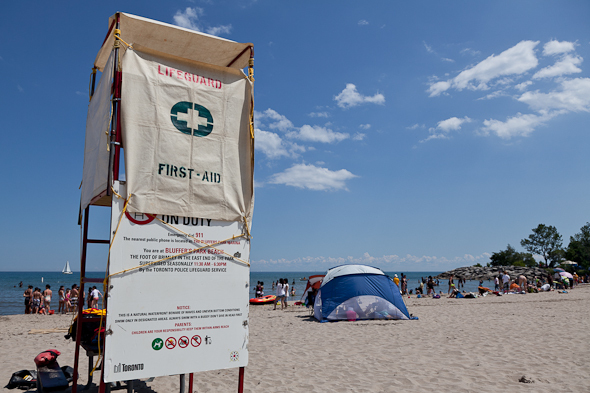 If you're searching for a large sandy beach, where sand (not rocks) greets your feet upon entering the water, and which feels isolated while being easily accessible, then the beach at Bluffer's Park is for you. 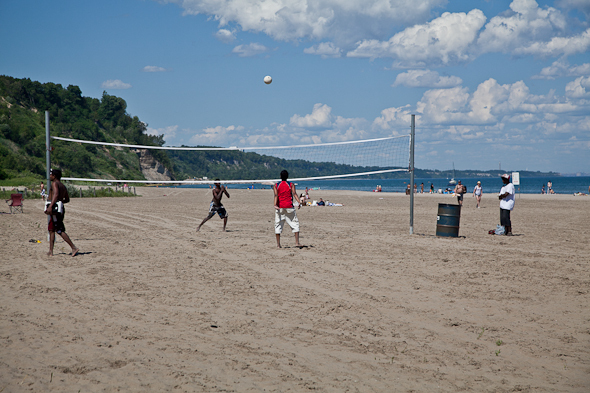 One of the beach's main attractions is the Scarborough Bluffs that surround it. These towering white cliffs cover 20 kilometres of Toronto's eastern waterfront and make for a striking contrast when paired with Lake Ontario's shining blue waters. Formed over the course of the last 100,000 years, the Bluffs are always changing. Unprotected, they erode quickly — at a rate of about 1-metre per year — and this erosion is powerful. In fact, sand from the Bluffs formed the Toronto Islands. It washed away from cliff tops to form the jagged spikes of the Cathedral Bluffs that overlook the beach, and if you put your ear right up to the bluff wall, you might even hear the sand shifting at the base. 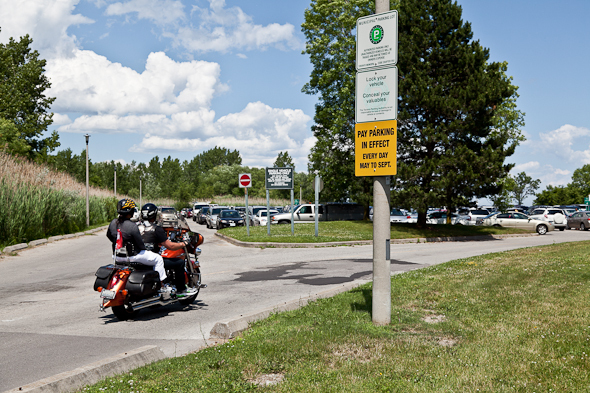 You can access Bluffer's by car, bike or transit, especially with the recently added bus route that takes beach-goers from Kennedy station to Bluffer's Park Beach. 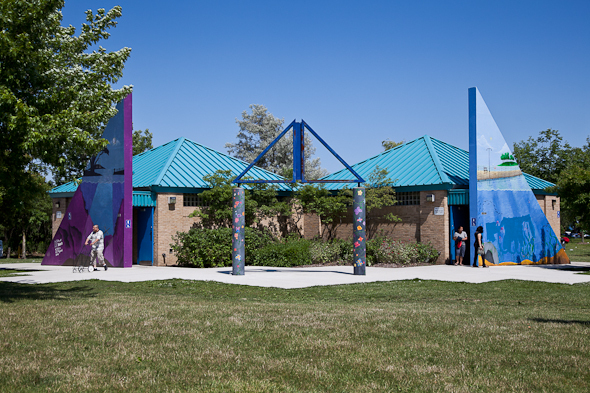 Once you get to the park, head to the very eastern edge to access the large beach. This is one of the city's better beaches for those who are usually uncomfortable with lake swimming, as it's not rocky, the water quality is good and it's shallower than most other city beaches. There are a few areas in Bluffer's Park that are well-suited to swimming, but others sometimes suffer from poor water quality. 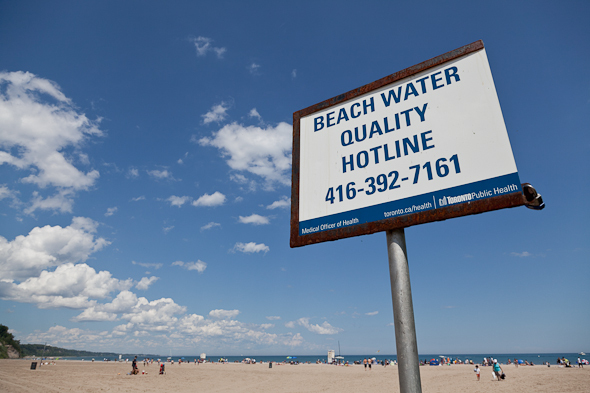 Bluffer's Beach once had some of the poorest water quality in Toronto. After a 2006 study by Lake Ontario Waterkeeper and investment in restoration from the City of Toronto, water quality improved dramatically. If swimming isn't your thing, don't despair, there's a lot to do at Bluffer's. You can fish from the shore or charter a fishing guide who will take you out on the water in search of sport fish. The park itself is huge and makes for a great spot to enjoy a picnic. If you didn't pack a lunch, there is a full service restaurant and bar at Bluffer's Park Marina. A series of stormwater management ponds (that are prettier than they sound) dominate the west end of Bluffer's Park. These ponds capture stormwater from the city and filter it in an effort to keep pollution out of Lake Ontario. As you walk the interconnected boardwalks around the ponds, you often catch glimpses of birds and other wildlife. Built in 1975, Bluffer's is a magical place. Being Toronto's most appealing beach, and boasting tens of thousands of years of earth history in the bluffs, you have to visit at least once to truly know this city. Directions by car: Pay parking at the foot of Brimley Road. By TTC: 175 Bluffer's Park, running between Kennedy Station and Bluffer's Park Beach. Other perks: You can ride your bike up and down Brimley Road and pretend you're in the Tour de France. Aggressiveness of seagulls and geese (out of 3): Birds are most pesky near the picnic area, but due to the bird relocation program, there aren't many to bother you right now.